So yesterday I finally got to see the Olympic Park from the inside. After several frustrating days of trying in vain to log on to the Paralympics’ ticketing site, I was at work minding my own business when a round robin email from our Help desk popped up in my inbox, saying that there was a day pass going free to whoever called up first and asked for it. And so instead of my usual Wednesday evening swim, I found myself in Stratford, wandering round the Olympic Park. “Day pass seats for the Basketball Arena are still available,” the PA systems blared, as I ambled about, trying to figure out what to go and see. 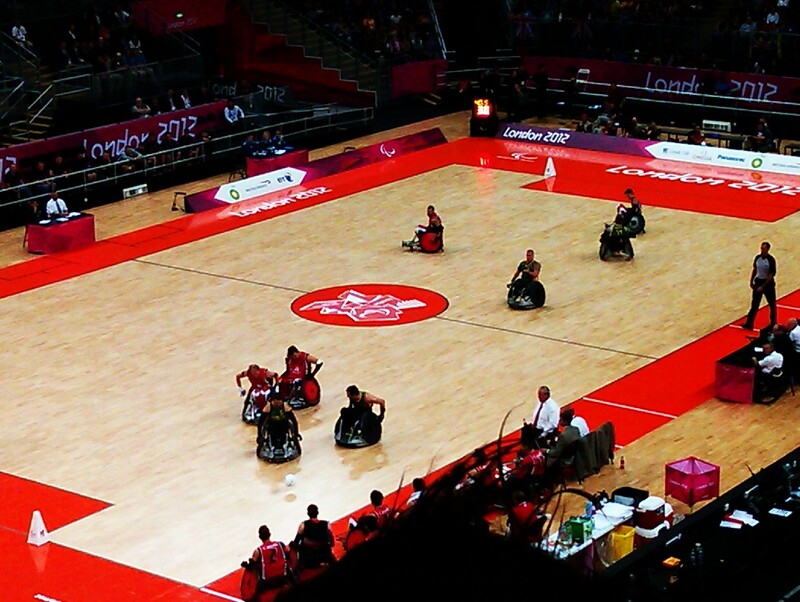 Wheelchair basketball was the main reason I’d spent so many fruitless hours on the ticket site; now that I was here – for free – I was definitely going to see some! No, I wasn’t. Apparently, basketball had been moved to the Venue Formerly Known as the O2, making room in the Basketball Arena for something else. Not for the fisrt time, the Olympics and Paralympics introduced me to a sport I never knew existed. Before yesterday, if you’d mentioned wheelchair rugby (aka “Murderball”) to me, I’d have assumed that it was some fake sport from a Ben Stiller film (as it happens, there is a film about it – but it’s a documentary). “A mixture of basketball, handball and ice hockey,” our host described it. He could have added stock car racing. With slimline Daleks instead of cars. This is a game with only one medal (no second or third prizes here); one in which women compete alongside men. The first “murderball” game of the 2012 Paralympics was between Canada (where the sport was invented in 1977, according to our host) and Australia. Four eight-minute blasts of pure adrenalin, beautifully (and chaotically) choreographed. Sandwiched between wheels that sloped at bizarre angles, the players whirled about on the hardwood floor. They bumped into each other – hard. Wheelchairs flipped into the air and landed face down. Every now and then, techies would run onto the court to replace a damaged wheel. Of the two teams, the Australians seemed much better at ‘long distance’ goal-scoring. The moment you saw Ryley Batt (in the number 3 shirt) with the ball on his lap, you knew he was going to have an uninterrupted roll up to Canada’s goal line. The Aussies were also the more aggressive tacklers. That said, Canada’s goals were a much more collaborative effort, and subsequently more exciting (and, dare I say, artistic) to see executed. The spectacle brought back memories of the Toronto Maple Leafs game my friend and fellow writer Mags Storey took me to see when I visited her fair city at the beginning of this year. In the end, Australia won by 64 goals to 52. I left after the first quarter of the Japan v France game that followed, as it had gone past 10pm (can’t stay out too late on a school night). But if I was tired, I was too stoked up on murderball fever to notice.